A Sunday morning visit to check out the newly introduced breakfast service at Harold’s Tap Room was a pleasant reminder of how many different ways there are in the city to enjoy brunch. Houston has many sumptuous ones that feature a seemingly endless parade of chafing dishes. All-you-can-eat dining is set to the beat of a live band and if someone leaves less than stuffed, it’s his own fault. These culinary celebrations can be impressive—as well as expensive, crowded and noisy. Surrounded by strips of antique storefronts (and housed in a nearly 100-year-old former menswear store itself), the casual bar represents an interesting intersection of where past meets future. Bellying up to a bar for a daytime meal seems like a terribly modern idea, but it’s actually a very old one. In the 1700s, travelers relied on taverns that provided (not very good) meals. I was invited to try some of Jarrett’s favorite selections, which are approachable and tend to highlight high quality, fresh ingredients at their best. Take, for example, the housemade ham and cheese biscuit. Chef Antoine Ware cures the ham himself, and it’s stacked high in a simple presentation that allows it to be the star. Perhaps even more interesting is the more complex breakfast pizza. The eight-inch round is big enough to share with a friend, and the ingredients on the $10 delight conspire to create nuanced flavors and textures. There’s smoky bacon (also cured in-house), perky chunks of tomato and the cool crispness of arugula, all enriched when golden egg yolks of locally sourced eggs yield to the fork. There’s quiche as well—generous, homey wedges of it. On the day of my visit, it was imbued with yellow squash and zucchini. Jarrett said the vegetables will change depending on what is in season. Some of Tillman’s creations modernize affectionate throwbacks to the time just before “mixology” became such a big deal. The Walnut Espresso Martini was, in fact, cited by every staff member I encountered as the “must try” drink—and even someone who froths over what constitutes a “real” martini might let their hair down a little over this one. The key is balance, and there’s plenty of toasty espresso in the drink to dance with Nocello (Italian walnut and hazelnut liqueur) and a healthy spike of 1876 vodka made in Dripping Springs, Texas. Of course, every brunch needs a bloody mary, and Harold’s has that covered with its reasonable-priced $8 Texas Mary. It has the qualities a mary-lover is looking for: depth, spiciness, zing and a touch of unifying sweetness. I asked Jarrett if the mix was made in-house. It turns out that it’s a modernized throwback, too—a spiked-up version of Mr. & Mrs. T’s. That was a little surprising, considering that most of what Harold’s does is made from scratch, and those who avoid anything that contains high fructose corn syrup will want to pass on this. That said, it’s the same mix that several airlines serve, so if a bloody mary is your drink of choice, you’ve no room to talk. In the evening, simple, classic cocktails are the order of the day. “When was the last time you saw a White Lady on the menu?” asked Tillman. (A White Lady includes gin, orange liqueur, lemon juice for tartness and an egg white for frothiness.) There are also 14 local craft beers on tap. On any given day, the selection might include Saint Arnold, Eureka, Spindletap and Town In City. Jarrett’s “baby,” though, is the wine-on-tap served either by the glass or by sizable carafe. On the day of our visit, there were three rosés, a Chardonnay, Pinot Grigio, Sauvignon Blanc, Cabernet, an Italian red blend, Pinot Noir and a California red blend. Many wine lovers might not know that these days, wine on tap is not cheap or poorly made. The reduced packaging and no need to label often makes for good deals on quality sips. Harold’s Tap Room is open Tuesdays and Wednesdays from 10 a.m. until 11 p.m. (later if it’s busy), Thursdays and Fridays from 11 a.m. to 2 a.m., Saturdays from 10 a.m. to 2 a.m. and Sundays from 10 a.m. until 9 p.m. Food service ends an hour before closing. 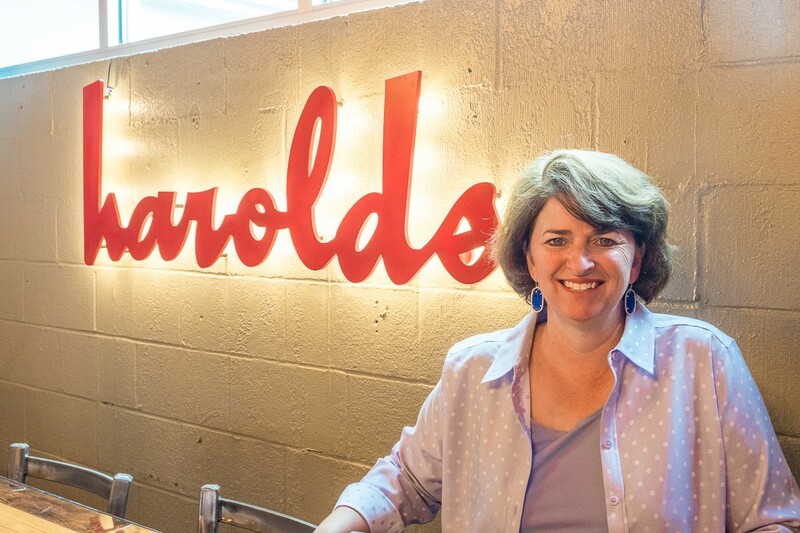 For a more traditional, full-fledged meal experience, head to Harold’s restaurant upstairs.